Thank you. There is no other way to start this letter to you without thanking you. You have been an amazing dog, mom and friend. One month before you entered our lives, we opened Newtown Square Veterinary Hospital. Our hearts were led to partner with Senior Dog Haven and Hospice, the organization that would take you into their care. 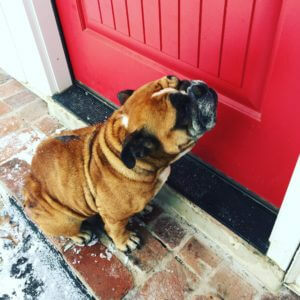 On December 28th, we received word of a senior English Bulldog coming to see us. You were headed our way! It was said you may have multiple masses in your abdomen, or heart failure. A sweet couple walked in, and behind them you waddled. Your eyes were low, your belly was wide and your skin was bare and leathered. We thanked them many times before they departed. You watched as they walked away; confused as to why you were now with us. 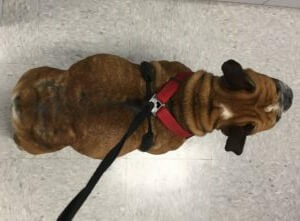 As we set up x-ray, we spoke of the many different problems a 9 year old English bulldog could have. We agreed it was a remote possibility that you could be pregnant; it was obvious you’d had many litters before. We were more concerned about a tumor or another sad diagnosis. As we stared in disbelief at your x-rays, we began to count little spines and heads. Senior Dog Haven and Hospice, and Puppies? You looked confused about all the excitement as if it were old news to you. The next day an ultrasound was done to check the viability of the puppies. Hearts were beating and your puppies were kicking! You never complained. You snuggled your head into our chests, and accepted all of the love we could give. The next day, December 30th, only two days after you entered our lives, you made it even more interesting and went into labor. Labor in English Bulldogs is not always easy, and yours would be no different. We decided upon a c-section. Abby, we already loved you so much; your health was our first priority! You were probably confused as new faces emerged, petting your head and rubbing your belly as the three people you knew moved quickly throughout the hospital. Those new faces were our spouses and friends; they came to help with your puppies once they arrived. You sweetly loved them all, including your human foster brother – he helped too! Here is what happened while you were “napping.” You were sedated and prepped for a c-section. Your puppies were big! One by one they came out and were passed off to be revived. You astounded us all. Your anesthesia was beautiful, your puppies were beautiful, and we made sure this would never happen to you again. You are officially retired once these puppies are adopted to their forever homes. You needed your rest after your ordeal and we were grateful for you to take a much needed break. Abby you are an amazing mom! You tended to all of your puppies right away, and stayed in uncomfortable positions to let them nurse. 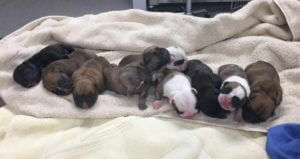 Nine puppies is a large litter for any dog, let alone you sweetheart, an English bulldog. We mourned with you when we woke to find two of your babies had passed away overnight. Side by side we fought for, and lost, a third puppy who took a turn for the worse. 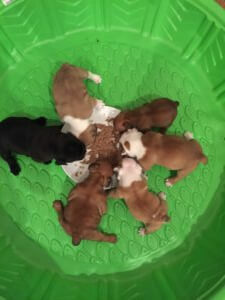 We knew your pups had an uphill battle from the beginning with not only such a large litter, but a lack of nutrition and prenatal care. With one amazing momma and six thriving babies, we continued our journey together. Your puppies are five weeks old already Abs! They are getting teeth in, they are playing with toys, and they are as sweet as you are. Since your time with us Abby, you have stolen a place in our hearts. You are our Abby, Momma, Snaggles, Abby Cadabby, Abs, and Snaggies, but mostly you are our Good Girl, and we think that is your favorite. Did you know that when we tell you that you’re such a good girl, your whole rear-end wiggles? Abby, you have taught us so much about how resilient dogs can be. Thank you for allowing us to be part of your story. Best of the Main Line! It’s our birthday, and we’re giving YOU presents! Not All Online Pharmacies Are Created Equal! Newtown Square Veterinary Hospital is a progressive, boutique-style, full service animal hospital created by Dr. Heather DiGiacomo, VMD. We are proudly located in the heart of Newtown Square and easily accessible from Wayne, Malvern, Paoli, Berwyn, Villanova, Ardmore, Devon and Bryn Mawr.